I recently had the great pleasure of meeting David LaPlantz—even if just virtually for now. Through myriad connections (that prove how small the world of book arts really is) David phoned me to chat recently and that call made my day. David is currently re-publishing his late wife Shereen’s book titled Innovative Bookbinding: Secret Compartments and Hidden Places. 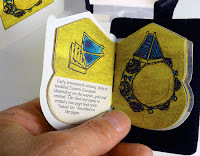 That book was produced by Shereen in an edition of 3000 hand made copies that included secret pockets, pullouts, pop-ups and more. It is a treasured and sought-after book that we are all excited to see make a comeback. In chatting about this book David mentioned that he has copies of a limited edition artist book that Shereen created in 1994, Historical Jewish Wedding Rings, that he wondered if I would like to carry in the gallery. As you can guess, I jumped at the chance. Anyway, that April event was presented to members of the Denver chapter of the American Institute of Graphic Artists (AIGA) and she presented a slide show of artist books and other types of paper arts. The photos from that slide show were all photos from Shereen’s book, Cover to Cover. Then Diana gave us all a few sheets of handmade paper and we sewed two books, a simple pamphlet stitch booklet and an easy side-bound ribbon binding. (Yes, I still have those books!) Sadly, Shereen passed away in 2003, after inspiring so many artists and a whole movement. To this day I can go through Cover to Cover and tell you exactly which books were in the slide show and why they proved to be life-changing inspiration to me. That slide show is why I am where I am today. I like to say I that at that moment I was infected with this disease called book arts. After that night I started taking every book arts workshop I could find in Denver, plus I even traveled as far as Guatemala to take a workshop. Today, all these years later, I still make my own artist books plus have the great honor of owning this little gallery that specializes in all things book and paper. Now you can see why I was so pleased to talk with David LaPlantz about his re-publishing project. I can tell that he misses Shereen dearly and am I so grateful that he has entrusted me with her wedding ring book. 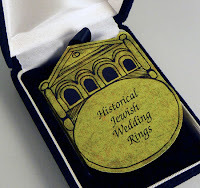 Click here to learn more about Historical Jewish Wedding Rings. This page also contains Shereen’s biography and her artist statement and if you are at all like me you’ll be thrilled to add this to your collection of truly remarkable artist books. I was one of the lucky folks that took a three year long course from Shereen, in her and David's home/studio, where we met for five days at a time twice a year. I learned so very much from her, including the old Pagemaker software that gave me a way to print out text in formats I designed for my own books. I have a number of her old books, and was lucky enough to have one of my books in her Cover to Cover book. It was a very special time. Wow, what an amazing three years you must have had with Shereen. I've heard from others who were part of this circle of talent. You were all so lucky to have her share so much of herself. Here's hoping that someday, someone will be inspired to do another in-depth, long-term class with this kind of spirit.